A name was spoken, and a young child dressed in white walked onstage, carrying a candle. This happened eleven times. In the silence as the children walked, the occasional faint sob pierced the hall, all the more piercing for being forcefully restrained. After the eleventh name and child, eleven musicians stood and played Boris Pigovat’s string arrangement of David Zehavi’s “Eli, Eli” (“My God, My God”). By the end of rehearsal, everyone knew. As the horrible details emerged of the shooting at the Tree of Life Synagogue in Squirrel Hill, so did the idea for the concert. It was the desire of the entire institution to do everything possible, along with the rest of Pittsburgh, to foster unity and solidarity with the Jewish community. Sunday’s concert the next day began with an address by PSO Orchestra Committee chair Stephen Kostyniak (text included in the December 2018 issue of Senza Sordino) and a string quartet performance of “Eli, Eli”. The PSO website offered a free download of the orchestra’s recording of Barber’s Adagio for Strings, while a management team worked to find a date and assemble the elements of what became, a month later, the Concert for Peace and Unity. President and CEO Melia Tourangeau marshaled resources and handled community relations, Vice President of Orchestra Operations Tabitha Mae Pfleger organized the innumerable details of production and video recording, and Persin created the artistic design. It is a measure of the power of the idea that everyone said yes, without hesitation or reservation. PSO Music Director Manfred Honeck and Itzhak Perlman rearranged their schedules. The Mendelssohn Choir was in from the start. The director of the Pittsburgh Ballet Theatre School pledged the students who held the candles. Speakers Rabbi Jeffrey Meyers, Rabbi of the Tree of Life, Wasi Mohamed, Executive Director of the Islamic Center of Pittsburgh, Dr. Jeffrey Cohen, Chief of Allegheny General Hospital, and Liron Blumenthal, a senior musical theatre major at Point Park University and Squirrel Hill native, all agreed with spirit. A particularly powerful speaker was Ari Mahler, the trauma nurse who first treated the shooter. Through his deeds and words following the shooting, Ari, the son of a rabbi, became Pittsburgh’s living symbol of loving response to hate. Does it need to be said that everyone, from Mr. Perlman and Maestro Honeck to PSO musicians to the stagehands from IATSE Local #3, donated their services? Perhaps it does. The concert was presented as a gift to the community, benefitting the Jewish Federation of Greater Pittsburgh’s Fund for Victims of Terror and the First Responders Fund for the six officers wounded in the attack. The free tickets, distributed via website, “sold out” in two hours. The swift arrangement for recording for broadcast was thanks to responsive work by Debbie Newmark of the AFM and Deb Acklin at WQED. Condensation of the concert into a one-hour broadcast necessitated some cuts. The concert in reality began with Avro Pärt’s Cantus in Memory of Benjamin Britten, but Ravel’s “Kaddish” from Deux Melodiques Hebraiques for clarinet and string orchestra, performed by PSO Principal Clarinetist Michael Rusinek, began the broadcast. “It was important to set the tone early in the concert,” said Persin. The Kaddish, the Hebrew prayer for the dead, was followed in its musical setting by a reading of the text by Rabbi Meyers. It would be a poor use of space to relate the entire program in detail. Suffice it to say that it described an arc from mourning to pain that reached both its climax and release in the Largo of Shostakovich’s Fifth Symphony. The achingly symbolic reading of the names and playing of “Eli, Eli” gave way to the hope of “Lift Thine Eyes to the Mountains” from Mendelssohn’s Elijah, the soothing “Wie lieblich sind deine Wohnungen” (How lovely are thy dwellings) from Brahms’s Ein deutsches Requiem, Itzhak Perlman’s evocative and inimitable performance of John Williams’s Three Pieces from Schindler’s List, and, following Ari Mahler’s remarks, the cascading, crashing waves of “Nimrod” from Elgar’s Enigma Variations. Eleven times, the tower chime rang. Grief and remembrance, hope and resolve. We of the Pittsburgh Symphony Orchestra wish for you that you never have need to perform for such an occasion. 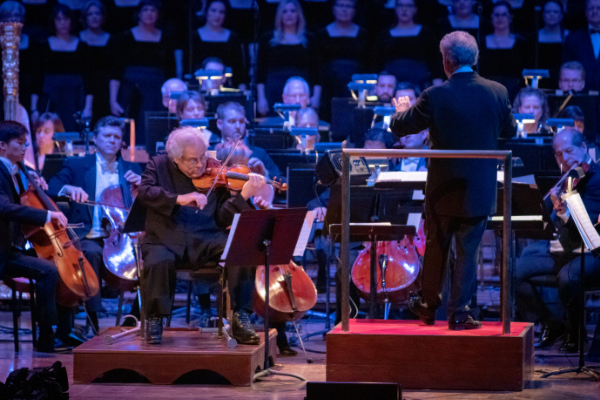 But if you do, you could do far worse than to have a community like Pittsburgh, a soloist like Itzhak Perlman, and a maestro like Manfred Honeck in front of you, and dedicated staff members designing an unforgettable program and making the multitude of parts work together. 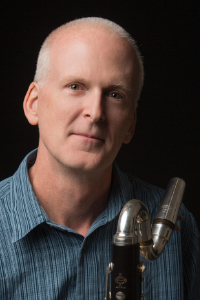 Note: The author is the bass clarinetist in the Pittsburgh Symphony Orchestra.